Pillows and Blinds and Drapes. Oh My! 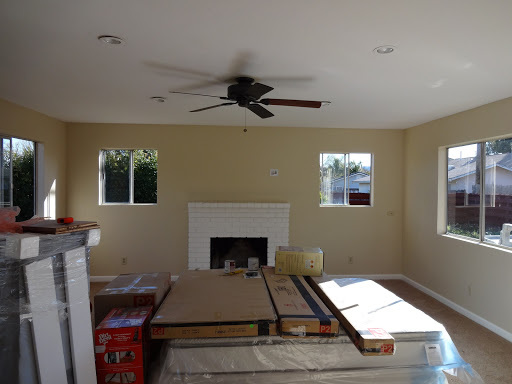 We still haven’t decided what we want to call our back room – TV room, family room, entertainment room… there are so many options! Well, whatever the room name is, we’ve been working on decorating it and it’s coming together nicely. 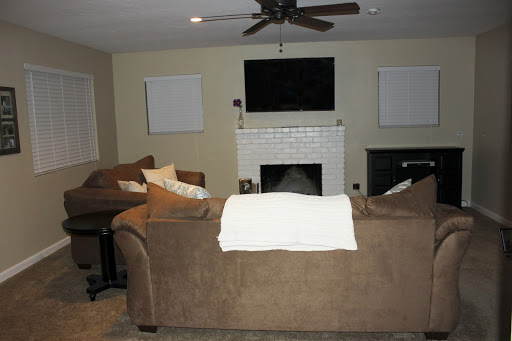 So far, the changes since the last time I talked about the room are – the addition of pillows, the entertainment center, hanging up a photo frame, and the blinds but it’s about to get another big update soon! 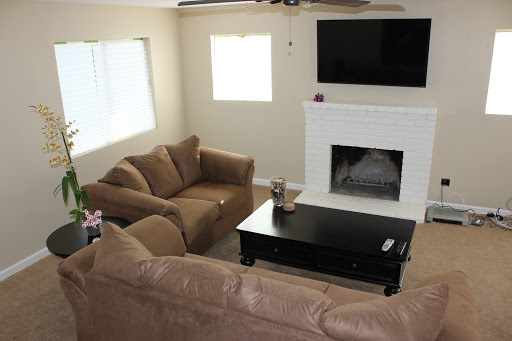 During the remodeling, termite damage was found by the fireplace so they had to open up the walls, replace the wood, and close everything up. So, here’s what the room looked like before the move-in process. Once we unpacked, the room looked wayyyy better. See those green lines at the top of the windows? Those are the temporary blinds being held up by Frog Tape (awesome tape by the way. I would highly recommend it). The temporary blinds kept falling down so we threw some frog tape up there to keep them in place. Not the classiest of looks but it took us a while to figure out what type of blinds we wanted to buy for the house. 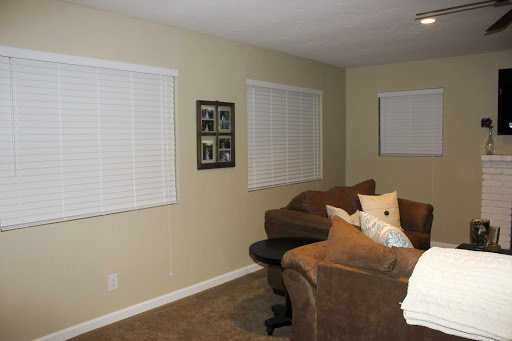 Thankfully, we finally installed faux wood blinds two weeks ago so the room looks wayy better. Over the course of the last few months, we searched high and low for the perfect pillows. 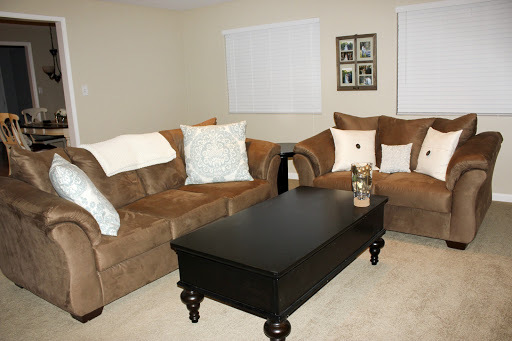 At first, I wanted pillows with several different colors to bring some life into the room. 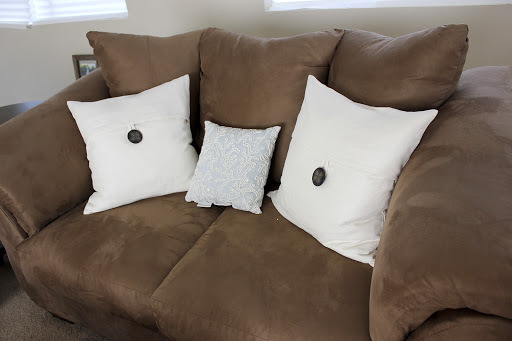 Then, as I thought about it, I realized that having several colors on the pillows wasn’t necessary, they just needed to have SOME color on them. When I went away for my friend’s bachelorette party weekend, CJ ran a few errands and ended up stumbling upon the most adorable pillows at Pottery Barn. He bought them, brought them home, and I am madly in love with them. 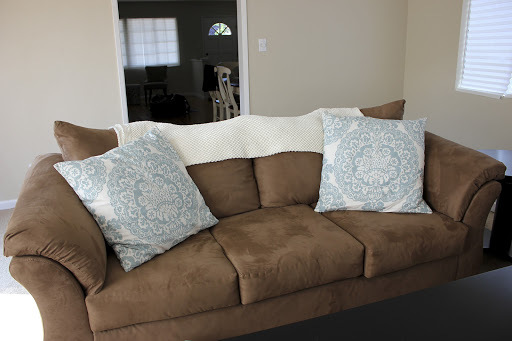 In person, the couch color is more like the photo without the pillows. 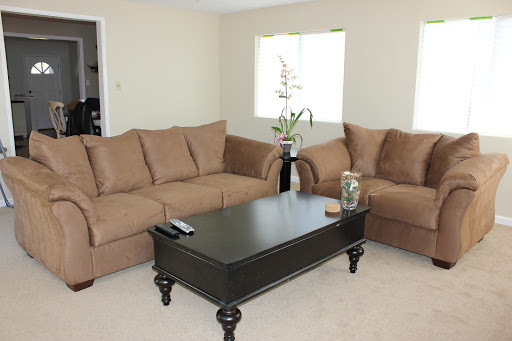 The flash changed the color of the couches in this photo, but you get the idea. It already looks so much better! 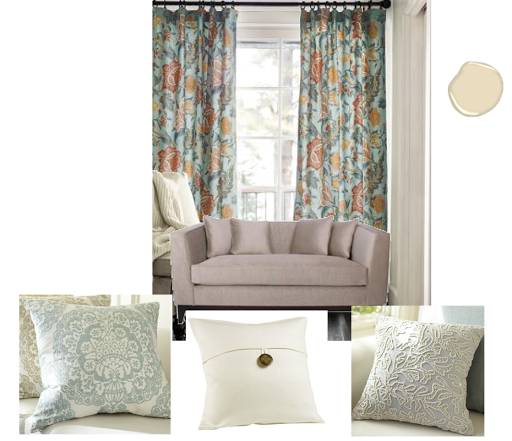 As far as what we just ordered that’s going to make a HUGE difference in how the room looks – drapes from Pottery Barn!! We are sooo excited to hang them. They will be hung on either side of the TV (so 2 drapes next to each window). 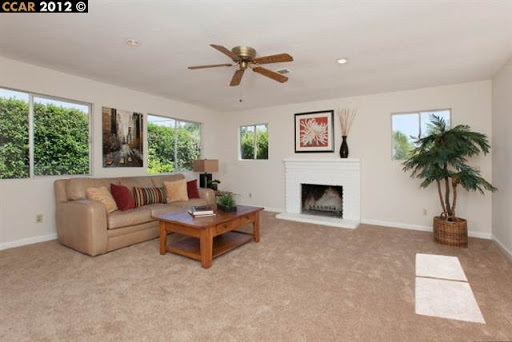 It will make the wall more dramatic and will bring more color into the room as well. Here’s a mini preview of how it will all look together. 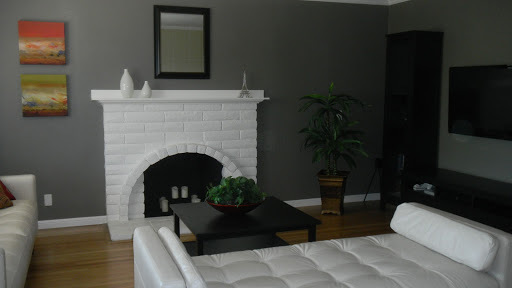 We’re also planning on painting the inside of the fireplace black since it looks a bit discolored from previous fires. We’ll make sure it’s fire-resistant just in case we use it for its’ intended purpose but, in the meantime, I’d like to put in a pretty candle holder. One of the houses I toured had one in their fireplace and it looked so cute! See below. 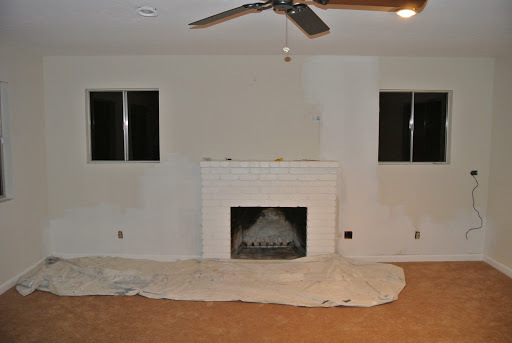 We need to do a bit of research on what type of paint to use as well as deep clean the inside of the fireplace before we start that project. The guy at Home Depot was skeptical that we could paint the inside of it if it’s already been used so we’re determined to prove him wrong! We are so happy with how everything is coming together in this room! !